John Pizzarelli has a terrific new CD that was born out of John's creative musical talents. For those of you familiar with John's performances, you know he always creates his own particular paths to music. Never satisfied with simply covering a great standard, John looks for new and creative ways to bring some of himself to the tune and something new to the listener. This approach is not without risk but pushing the musical envelope is what John Pizzarelli is all about. For this CD, John wanted to find a way to present some great old standards and some great old rock and roll tunes. 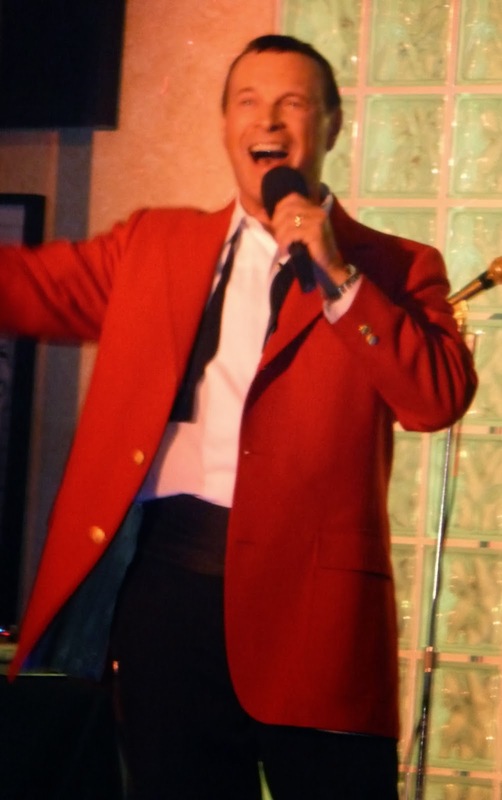 While John has always been faithful to the "Great American Songbook", he also has a love of the great songs of the rock and roll area. However, there is no way would John would be interested in cutting a new CD of simple covers of these songs. John came up with the idea of combining two songs or different sounds from different times together. We had the pleasure of hearing John perform some of the songs on his new CD in January at the McCallum Theatre in Palm Desert, Ca. The songs were simply outstanding. The first song John performed and also the first song on the CD was a combination of the Lennon/McCartney song "I Feel Fine" with the Lee Morgan classic "Sidewinder". Hard to visualize what this final song would sound like but it was just outstanding. John refers to the final product as "Lennon and McCartney meet Lee Morgan". Next, John did an arrangement of Tom Watts' "Drunk On The Moon" combined with the great Billy Stayhorn tune "Lush Life". Next, Neil Young's "Harvest Moon" was given an influence of "Shine On Harvest Moon" producing a new musical gem. There are 13 songs on this CD and each and every one has a story fully developed on the liner notes. I have to describe one additional song on the CD that was simply breathtaking. The James Taylor song "Traffic Jam" was rebuilt with the influence of Joe Henderson's "The Kicker". John's wife, the talented Jessica Molaskey wrote some terrific new lyrics and added her voice. John's description of this tune was "James Taylor and Joe Henderson as seen through the eyes of Lambert, Hendricks and Ross thanks to Jessica Molaskey's wonderful lyrics". John Pizzarelli has been working hard for years on his trade with much success. His guitar performances have always been top notch, but now his singing and his creative arranging abilities have brought him into a special class of outstanding musicians. This is a CD that needs to be in your collection. "Drunk On The Moon" "Lush Life"
"Take A Lot Of Pictures"
"I Can Let Go Now"
Listening to Carolyn Martinez sing is always a treat for the ears and the spirit. Carolyn has become a Desert favorite within a short period of time due to her ability to relate to a lyric and sing it like it was her life story. Carolyn is meticulous in picking her material, only the best of the best of songs for her. The result is a wonderful listening and emotional experience for her audiences. This is her second year singing at Vicky's, and she has more fans than ever going to Vicky's to hear her. Her rhythm section consists of Larry Holloway and Roger King. Larry is already on the top of everyone's list as a super bass player in jus the few years he has been performing in the Valley. The Drummer, Roger King has been getting a lot of work this season. Roger plays with soft hands that give perfect support to Carolyn's singing. Usually, David Ring plays Piano for Carolyn but tonight Bob Corwin was sitting in for David. Bob was more than up to filling the large shoes of David Ring and did a marvelous job of performing the arrangements with little time for rehearsal. Tonight Carolyn asked two popular Valley singers to come up to sing, Leonard Kaye and Ken Steele. 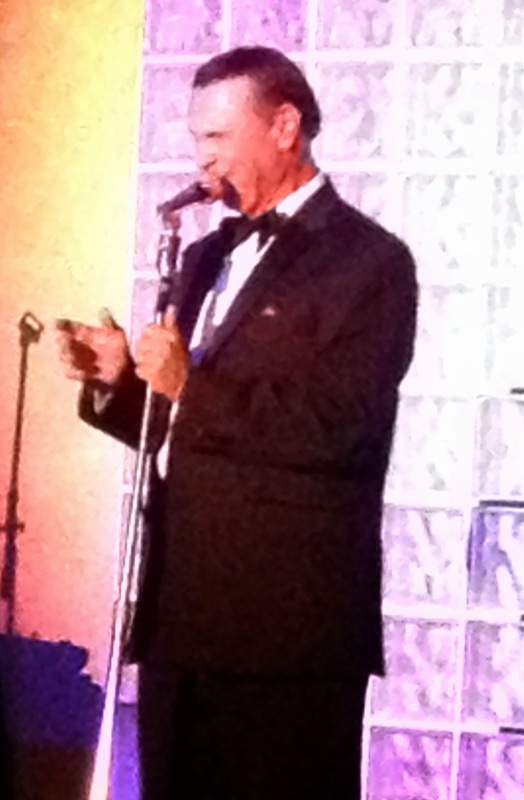 Leonard Kaye has a wonderful voice and a great relaxed singing style that is always a treat for any audience. 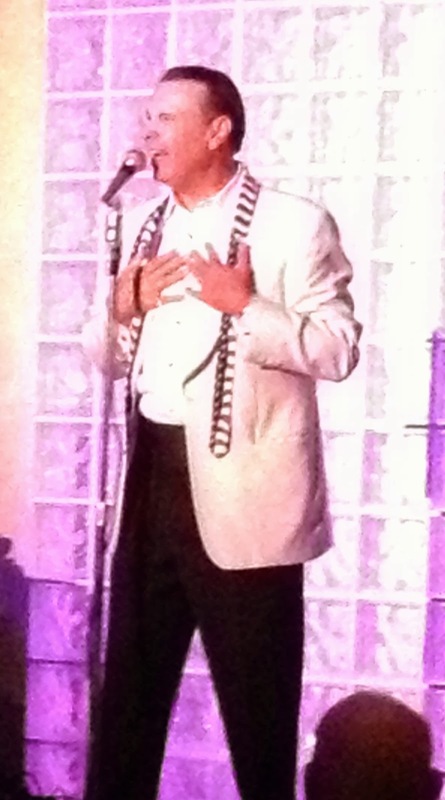 Ken Steele has a deep golden voice that would sound great even if he was reciting the alphabet. He is truly a seasoned professional, and I never get tired of hearing him sing. Ken and Carolyn surprised the audience tonight with a charming duet. Carolyn and her group perform at Vicky's on Monday nights. If you haven't heard her sing this year, do you self a favor and call for a reservation to hear her. She creates a wonderful night of music and I highly recommend you catch her act. 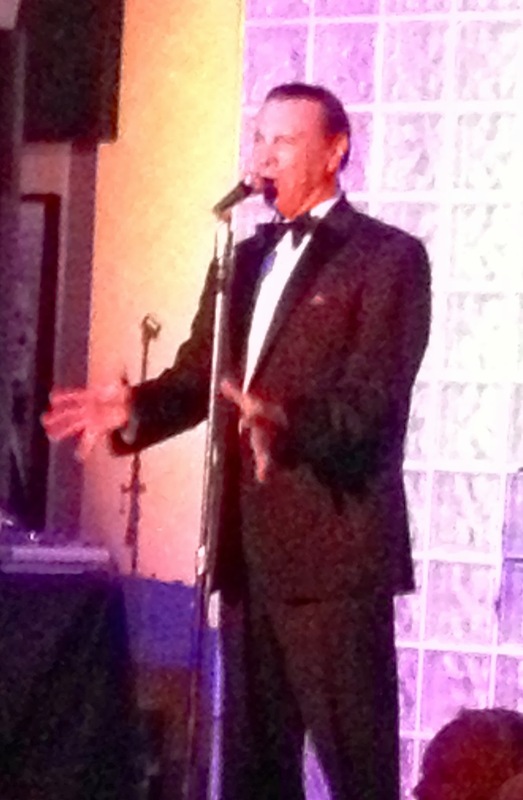 Every Tuesday night there is a "Rock & Roll" party at the Indian Wells Resort Hotel staring Michael D'Angelo. Michael has a strong voice, and it's clear to everyone that he really enjoys singing the songs of the past that we all remember and love. Michael is especially wonderful recreating the sounds of the 60's singing songs like: "Earth Angel", "Unchained Melody", "Teenager in Love" and everyone's favorite "In The Still Of The Night". What's great about Michael's show is that you can dance in the lobby of the beautiful Indians Wells Resort Hotel until your legs give out! The night entertainment starts early at 5:30 p.m. with free dance lessons by Carl Davis. This is great fun for those who love to dance. 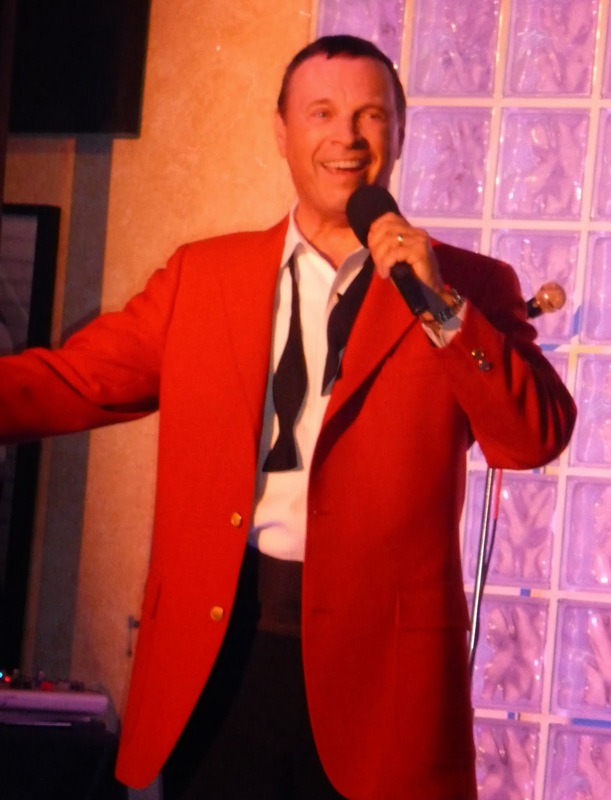 Then at 6:15 p.m. Michael performs and everyone can dance until 9:15 when his show ends. 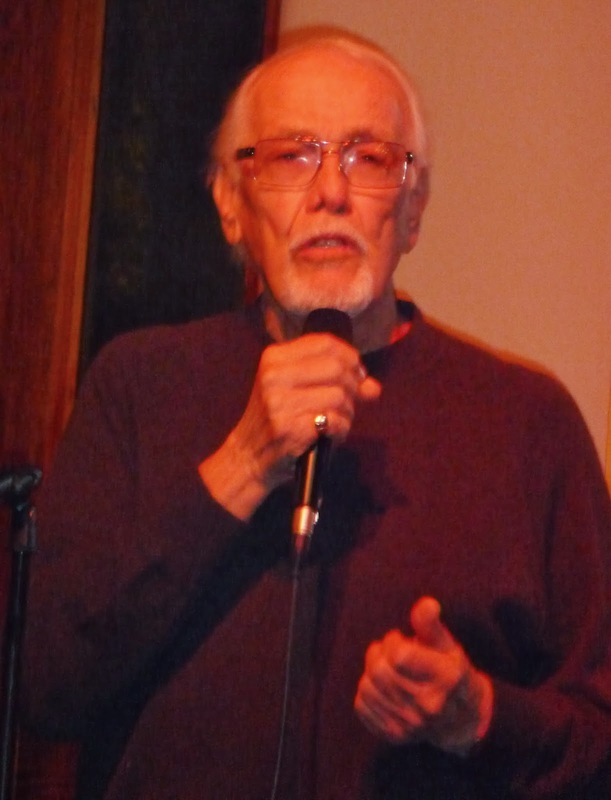 Larry Capeloto the great singer that sings with the Ted Herman Big Band on Sundays was asked to sing a song to the delight of the audience. Great fun, great atmosphere, great food, great music and no cover charge. The best deal in town! Make plans to see for yourself and don't forget to bring your dancing shoes. 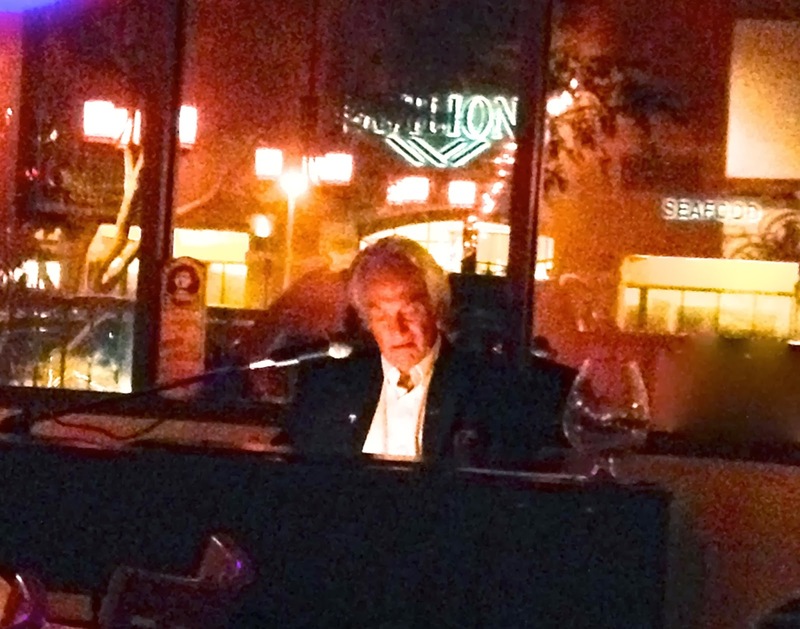 Lovers of music from the "Great American Songbook" should head over to Sabatino's Ristorante in Rancho Mirage on Wednesday nights where you can hear world-famous Pianist Bill Marx playing many of your favorite songs. Bill can play any genre of music, but he is at his very best playing the greatest American songs written by the best composers in the world. This is a rare opportunity to get to hear Bill sing and tell stories about the composers and the songs he loves. 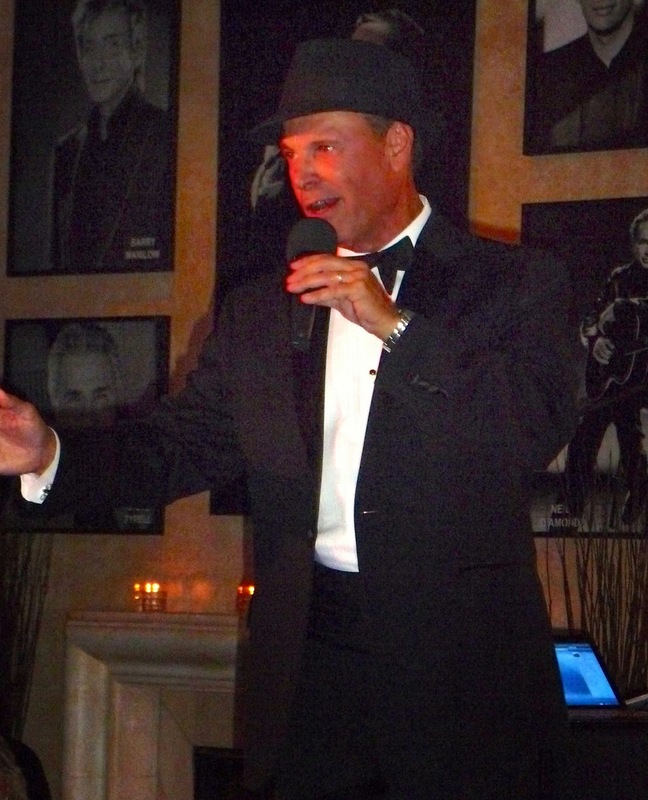 Bill plays at Sabatino's Ristorante every Wednesday, and I highly recommend you go to hear him. Sabatino's Ristorante has a long history in Rancho Mirage. It was one of Sinatra's favorite Italian restaurants. The food is really good and reasonably priced. So spend a night out, and have a great dinner at a reasonable price and hear one of the best Pianist in the country. Pre-Release CD Review: Rebecca MuMaine & The Dave Miller Trio "Better Than Anything"
I just finished listening to a new CD, "Better Than Anything" by Vocalist Rebecca DuMaine and the Dave Miller Trio and it's terrific. It's a swinging album that spotlights Rebecca's rich voice and her great sense of timing. The arrangements written by Rebecca and her father, Dave Miller, are fresh, new and outstanding. Lovers of music from the "Great American Songbook" will love this CD. Rebecca covers 15 standards putting her own delightful spin on each one. Rebecca DuMaine's music is grounded by her early musical influences which included Blossom Dearie, Shirley Horn and Peggy Lee. All these singers had one great talent in common, the ability to sing the lyric and give life to the emotion of the words. Rebecca has this talent too! What makes this CD even more special is the wonderful interaction between Rebecca and her Dad, Dave Miller. The timing on these songs are perfect as a result of the solid understanding between vocalist daughter and pianist father. You can feel the warmth and closest of Rebecca and her father throughout the album. 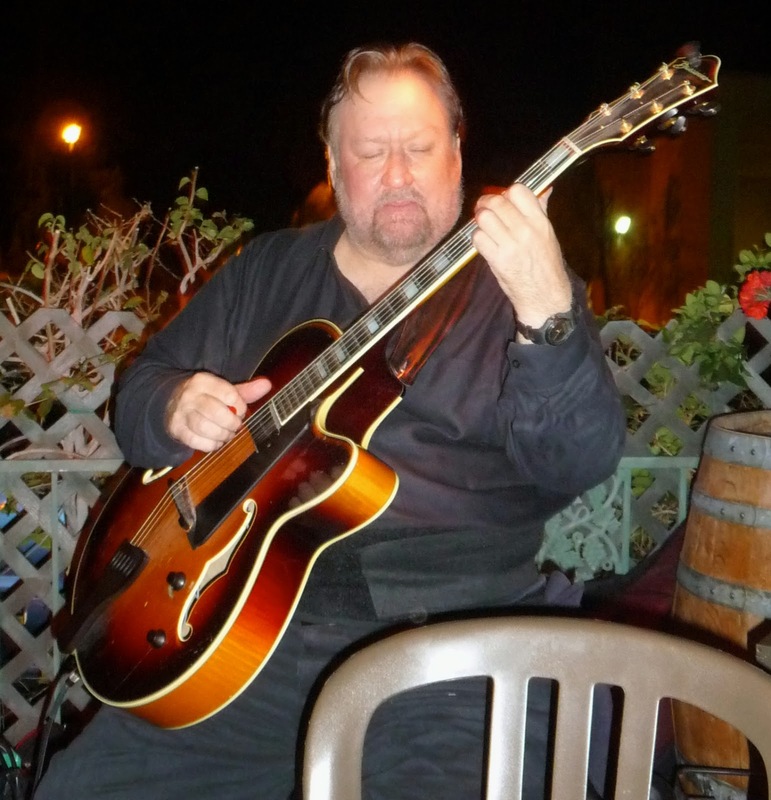 Dave Miller has been playing in the San Francisco Bay area for many years and is highly respected. Any vocalist would kill to have him as their pianist. How great that he has a daughter with such a great singing voice enabling them to record together. 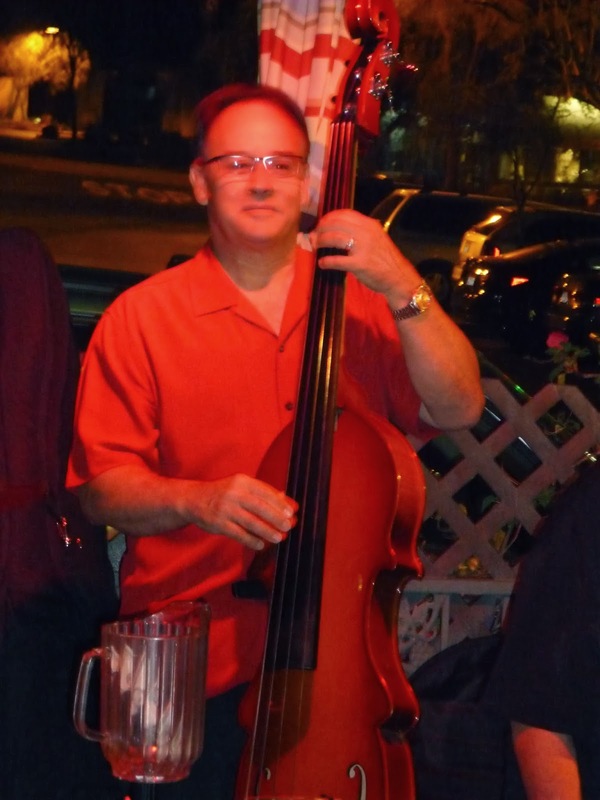 Mario Suraci is on Bass and his long musical resume is outstanding. 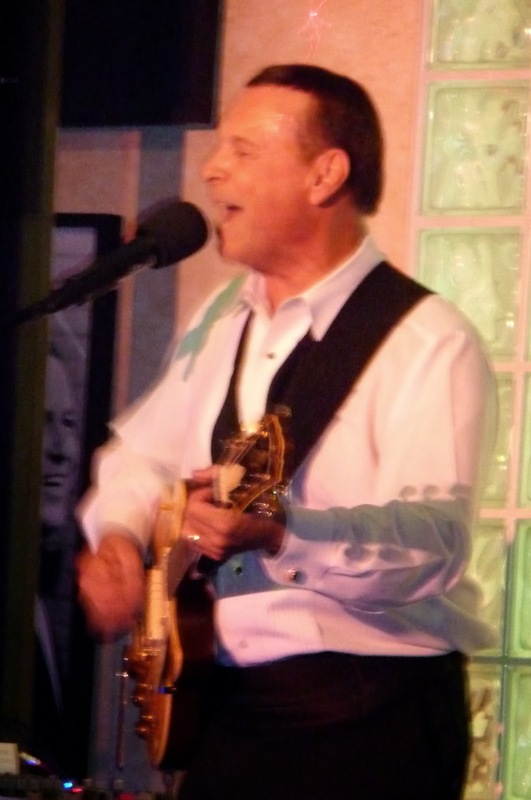 He has toured and recorded with many renowned performers, including Frank Sinatra, Benny Goodman, Joe Pass, Mel Torme Bernadette Peters and Elvis Presley. 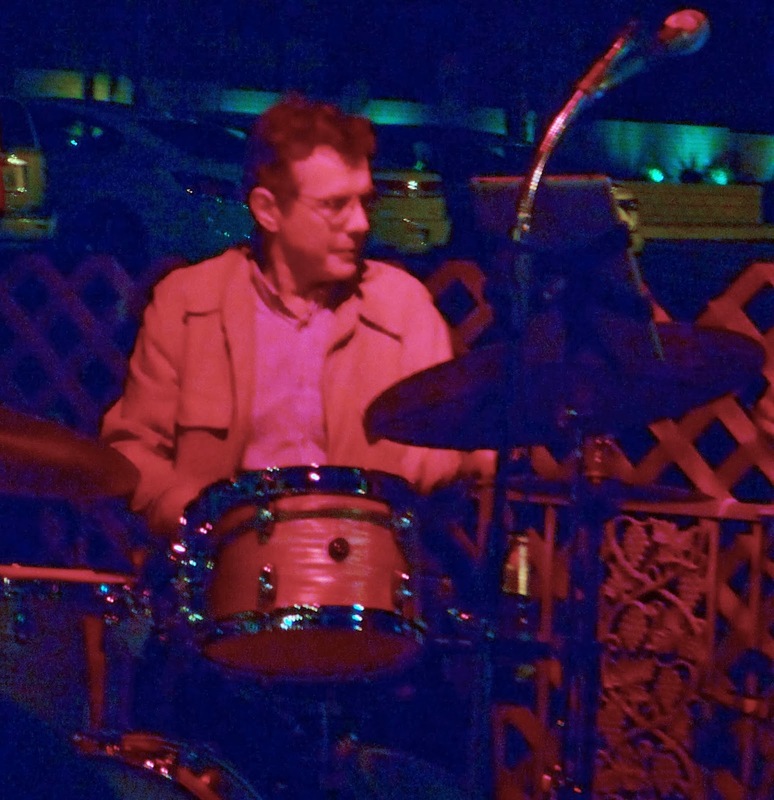 Bill Belasco is on Drums and is Dave Miller's longtime collaborator. 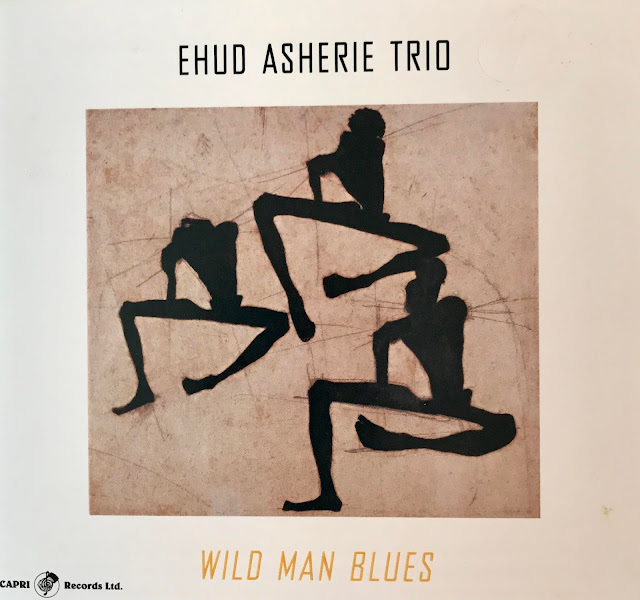 This trio is terrific in its own right, and I could listen to them play all night. The addition of Rebecca's wonderful rich voice puts the group over the top! This wonderful CD was produced by Rebecca DuMaine and Dave Miller for Summit Records. It will be released on February 11, 2014 and would make a perfect Valentine Day gift for any Jazz loving special person. I have attached a YouTube video of Rebecca and the Dave Miller Trio singing "It Might As Well Be Spring". Enjoy! When I decided to read "Rhapsody In Black" it was not because I was a life-long fan of Roy Orbison. I loved his songs but until the last year or two I thought of Roy Orbison as just another rock and roll performer, strange looking but with an unusual voice. However, over the last year or two I starting listening to Roy's songs again and developed a deeper appreciation for the beauty of his songs and his pure, strong voice. So when I saw this biography, I bought it hoping to find out more about the life and music of Roy Orbison. If you are a Roy Orbison fan and love the music of his era, I believe you will love this book. The author provides insights into many of the contemporaries of the "Big O". However, I have to tell you that the life of Roy Orbison, similar to many of his songs, were touching but depressing. Roy's life experiences are more than most people could withstand. In addition, even as brilliant as his songs, voice and performances were, Roy's professional career suffered because of underappreciation for long periods of time. What made this even stranger is that almost all of his contemporaries in the music business at the time, had only the highest respect for Roy's song-writing ability and his strong pure voice. Even today almost every performing star like Bruce Springsteen, Bob Dylan, Elvis Costello, Neil Diamond and Paul McCartney have been Orbison fans from the start of his career. John Kruth has done a great job researching and writing this book. The life of Roy Orbison was not an easy subject especially because of the terrible events he suffered through his life. I have attached a "YouTube" of Roy Orbison singing "Pretty Woman" with some friends you may know. 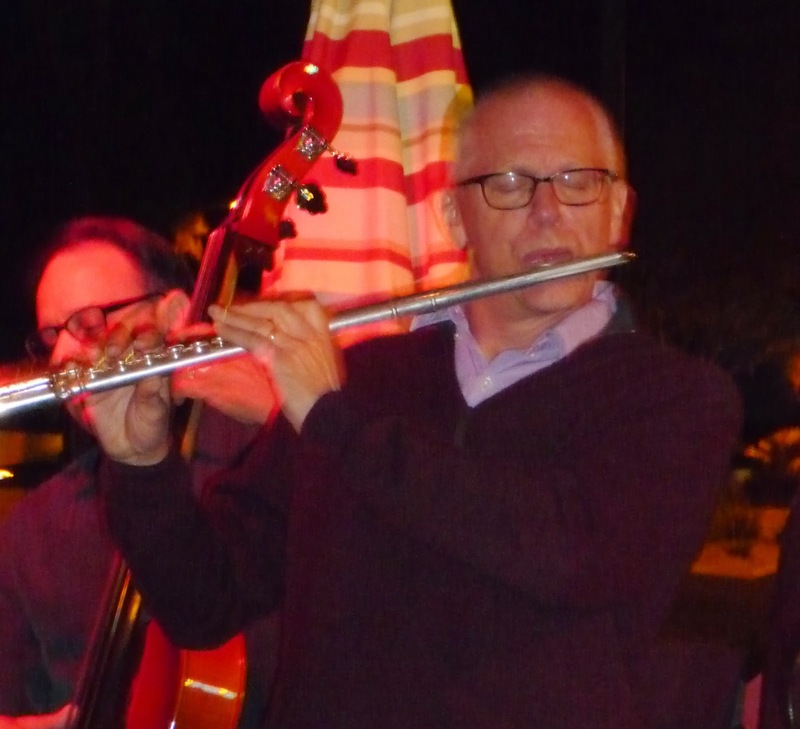 We went to Backstreet Bistro on Tuesday to see Bill Siatta who had gathered a group of super talented musicians to join his quartet for the night. 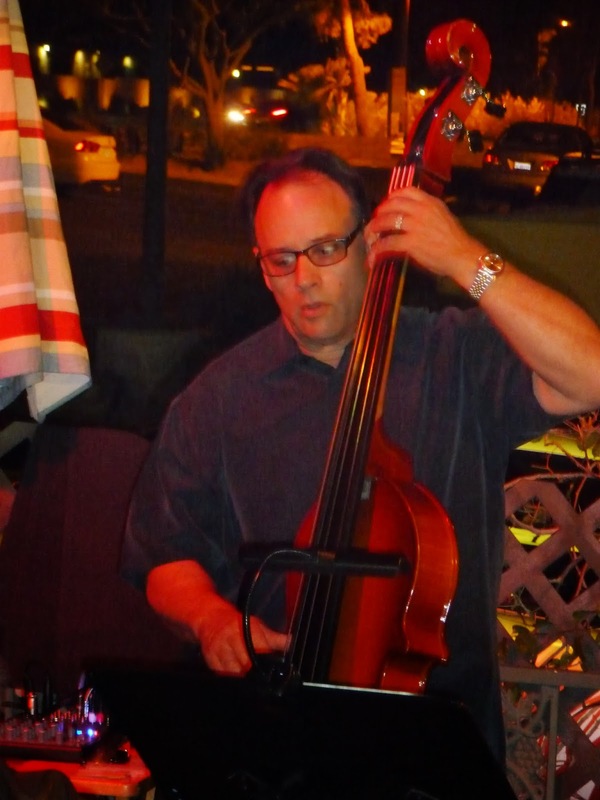 Bill does a great job bringing the best musicians in the Valley together for the Tuesday night Jazz series at Backstreet Bistro. Tonight Bill brought in the great flutist and Tenor Sax player from Canada, Tom Keenlyside along with Roger King on drums. A great combination of musicians that made for an outstanding night of Jazz. Bill Siatta and Roger King put together a wonderful rhythm section to support the Tom always sensational Tenor and flute playing and Doug McDonald solos. Its hard to describe how good Tom Keenlyside is, I think you just have to listen to him play and everything else needs no description. Plus, it is clear to everyone who hears Tom perform that he just loves playing and performing in general. He is a gift from Canada that just keeps on giving great music to the Jazz fans in the Valley. Tonight we even got to hear Tom sing and of course he is good at that also! I have also noticed that every time Bill Siatta bring in a new musicians into the mix, he plays to different and always higher levels. No doubt that Bill get motivated playings with so many different talent performers. His performance on the bass continues to evolve into better and better performance and his singing that Bill has worked on over the past couple of years, is really good. 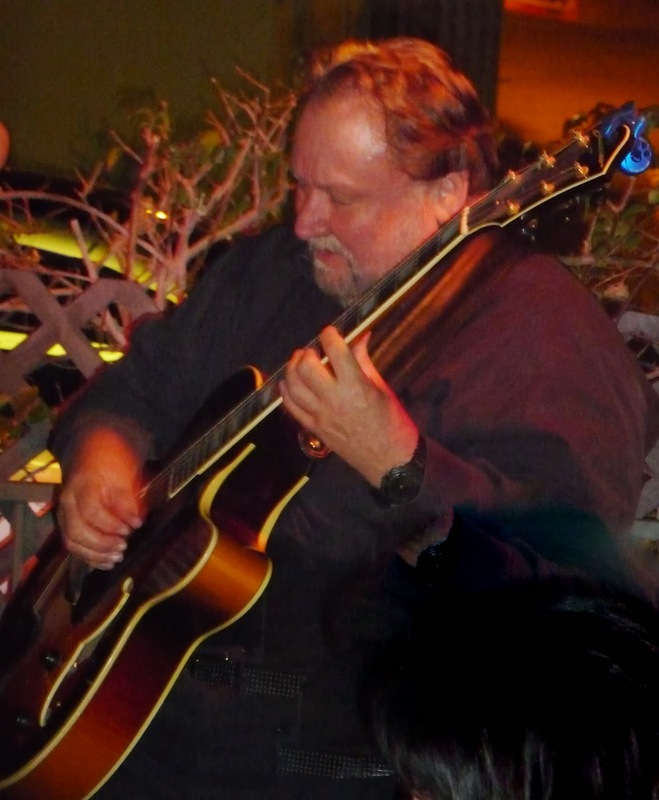 Doug McDonald in a short period of time has demonstrated to all that he is one of the most talented guitar players in California. He seems to really hit his stride when playing with Bill. Roger King seems to be playing in many venues this year and he polished and experienced drummer. His has soft hands that few drummer exhibit and fit into this particular group of musicians perfectly. A great night for Jazz and Jazz lovers. Drummer Dennis Burke came by during the evening and Bill asked him to sit in for a few numbers. I had not heard Dennis play before but I was impressed by his style and ability and I am sure I will run into him again in another venue. The Steinway Society of Riverside County presented one of their many concert events at SoCal Pianos in Palm Desert on Sunday January 26th. The Steinway Society of Riverside County was founded in 2002 by Ruth Moir who still is the president of the group. We all know that when times get tough, the first cuts school districts make are in the arts program especially the music programs. Today, most elementary schools have no music in their classrooms. The same is true for many middle and high schools who struggle even to maintain some kind of basic music development program for their students. This is why The Steinway Society of Riverside County was created to address these problems by providing interactive music education classes, hands-on instrument training and live performance programs designed to engage, educate and inspire children to reach for their dreams. The Society has been extremely successful in achieving their goals with their music programs touching over 20,000 children every year through exposure to music. This is an organization worthy of our support as their entire income is generated through donations. You can make a donation by visiting their web site at: www.steinwayriverside.org. Performing today was the always wonderful piano player Johnny Morris who brought two other fine musicians with him, Roger King on Drums and Danny Flahive on Bass. 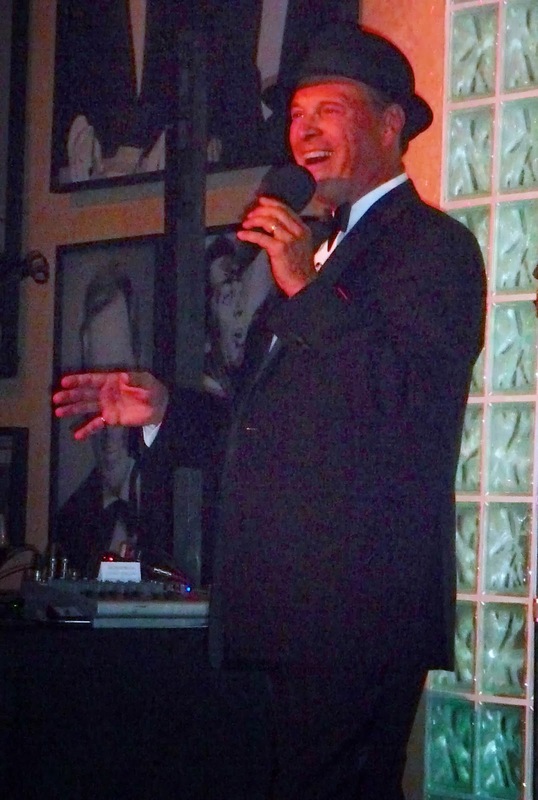 Johnny Morris has been playing for residents in the Valley for years and every time he plays, he just amazes his audiences with not only his great playing ability but his remarkable ability to select the greatest songs out of the "Great American Songbook". In addition, Johnny without the aid of any charts, plays every song requested by his audience. He calls this "Try to stump the piano player". He asks the audience to name any song they want him to play and Johnny has the ability and mental quickness to beautifully play all the songs. Another Johnny Morris secret is that he has the ability to sing the lyrics for most of these songs from memory. 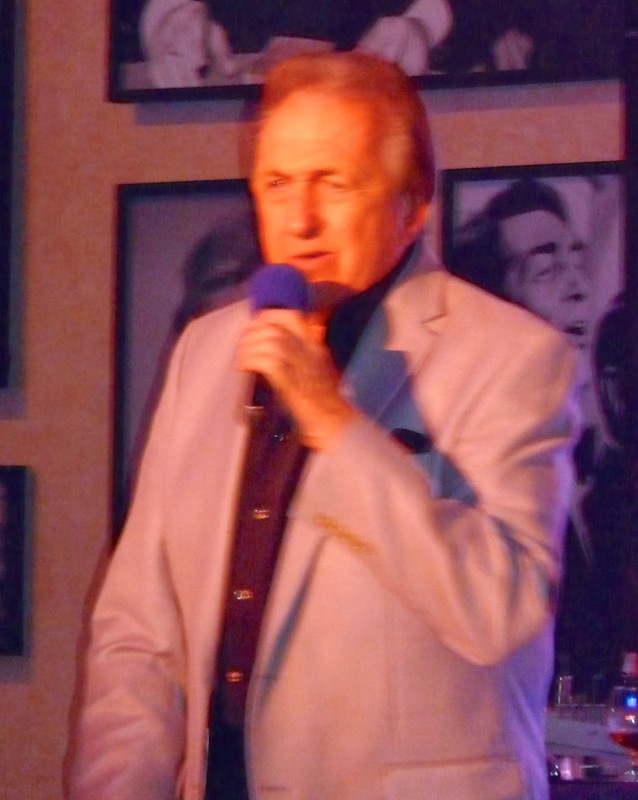 In the many times I have heard him perform, I cannot remember anyone stumping the great Johnny Morris. If you have not heard Johnny play recently, you can hear him again at the Backstreet Bistro every Monday night starting a 5:30 PM. He is one of the greatest piano players of standard music living today, and you can hear him right here in the Valley every Monday. 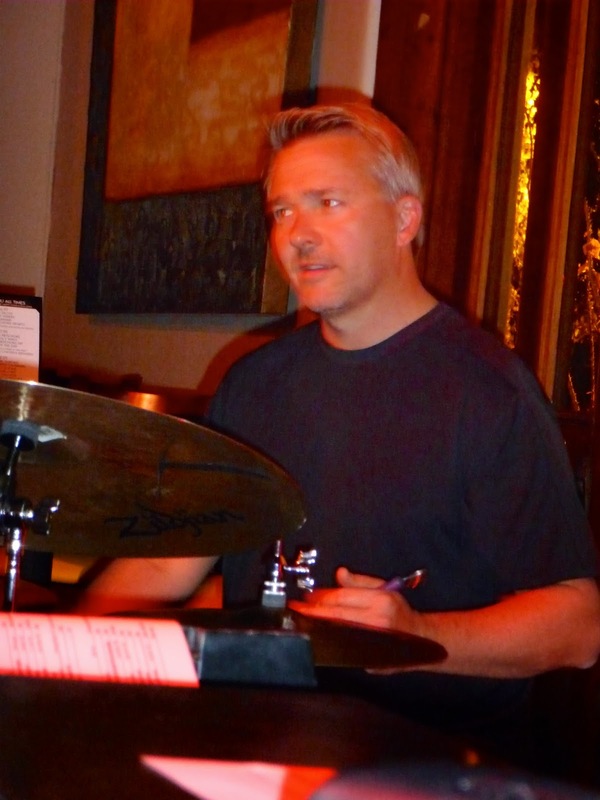 Roger King works as a private lender during the day and then becomes a world-class Drummer in the evenings. He has a great sense of performance and did an outstanding job today without the benefit of any charts or rehearsals. Roger plays with Carolyn Martinez every Thursday night at Vicky's. The third member of the group was Bassist Danny Flahive. This is my first experience hearing Danny play and he is nothing short of terrific. Johnny gave Danny lots of room for solos today, and he sparkled. There were a couple of major-league performers who came by today to support Johnny Morris and the Steinway Society. One of the greatest Harp players playing today, Ron Kalina played a couple of terrific ballads with the trio to the delight of the standing room only crowd. 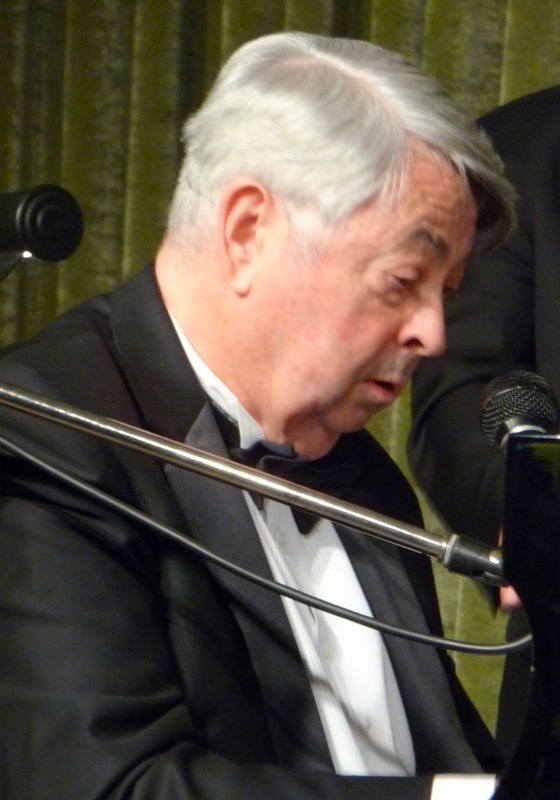 Also performing and having some fun was world famous piano player, Bill Marx. Bill and Johnny played a duet while continually changing seats and it was very funny. Bill is always a treat to hear and is always supportive of any event that helps develop music for children. 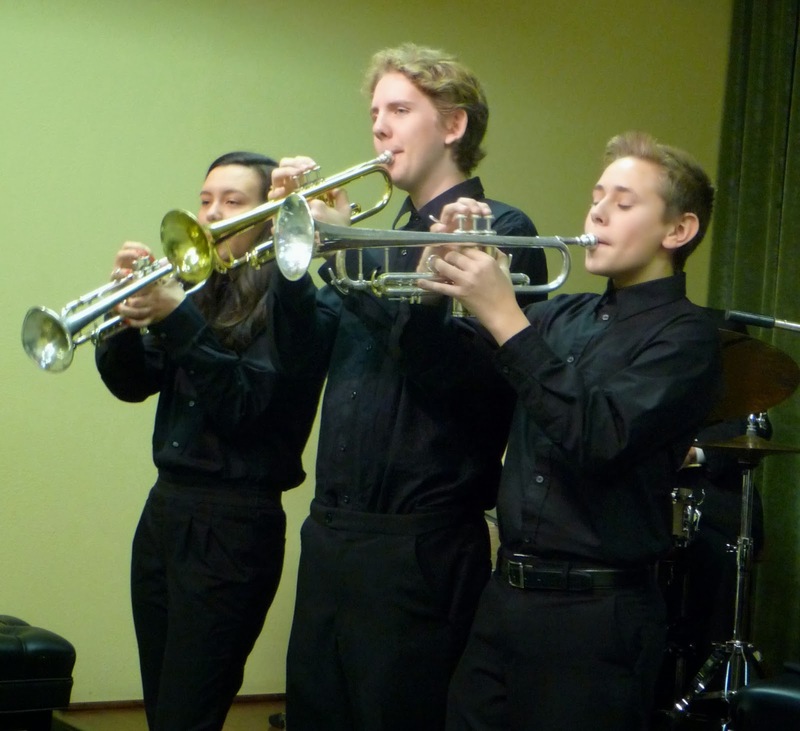 In addition today was a trio of student Trumpet players who were just a delight. They did a great job of performing the classic "Satin Doll" with the trio. 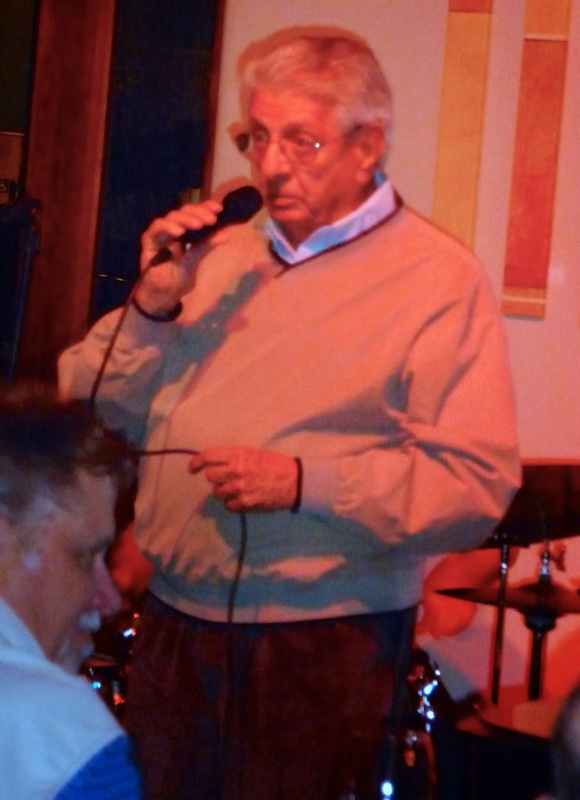 Steve Madaio was back holding court at Backstreet Bistro on Tuesday. It was like a celebration of great food, great wine and, of course, great music. This was my first visit to Backstreet since I arrived in the Desert, and it was really great. The Jazz area in Backstreet Bistro is small but intimate, and you get a chance to get-up close to the musicians. Steve had a great year in 2013, highlighted by his participation in two world class concerts. In October Steve was asked to perform at the 18th Annual Music Masters Series at the Rock and Roll Hall of Fame in Cleveland. The event was a tribute Concert celebrating the 50 year anniversary of the Rolling Stones as a band. To celebrate the Rock and Roll Hall of Fame hired only players who are currently playing with the Stones or those like Steve that toured with the band. It was a major event that I was very fortunate to attend. See the review pictures I posted on my blog in October 2013. For those that are not aware, Steve did a European tour with the Stones back in the 70's. The second world class concert that Steve participated in was in December 2013 with Stevie Wonder at the Nokia Theatre in LA. Not everyone knows that Steve has a lot of history with Stevie Wonder and has done a lot of recording with him including the fabulous "Superstition" and "Songs In The Key Of Life" albums. At this concert Stevie wanted to re-do the "Songs In The Key of Life" album and, of course, the first one he called was Steve. Steve did his usual outstanding playing tonight, especially on ballads! Now you know Steve can do it all from slow romantic ballads to raging Rock and Roll. Supporting Steve tonight was a group of the finest musicians in the Valley. Bill Saitta playing solid Bass to support the group including Steve's solo trumpet. Doug McDonald, while always great on guitar, was really special tonight. Maybe it was the effect of playing in the open air and receptive audience that brought him to higher levels. 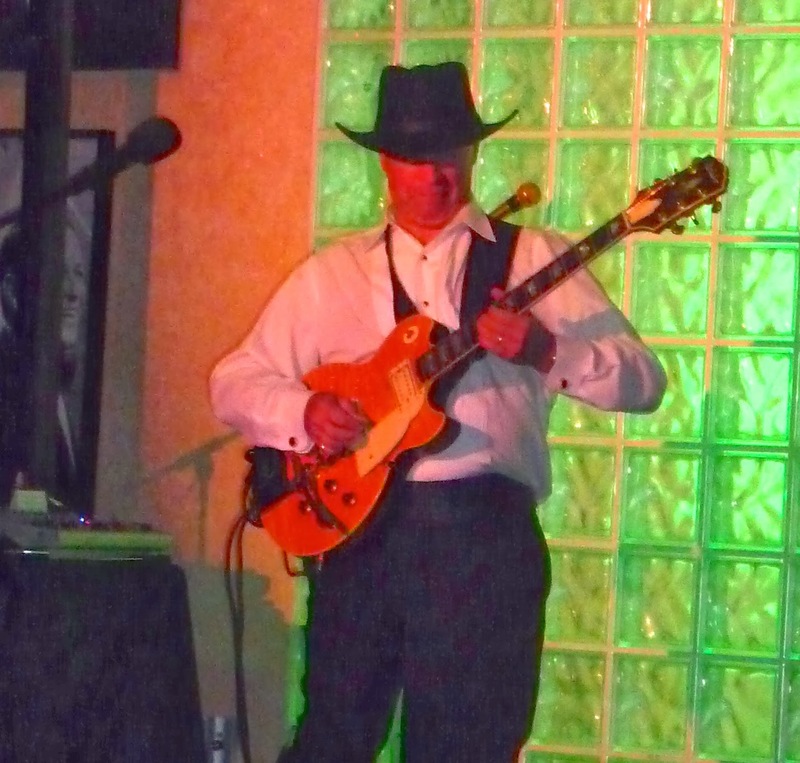 In any event Doug is one fabulous Guitar player! 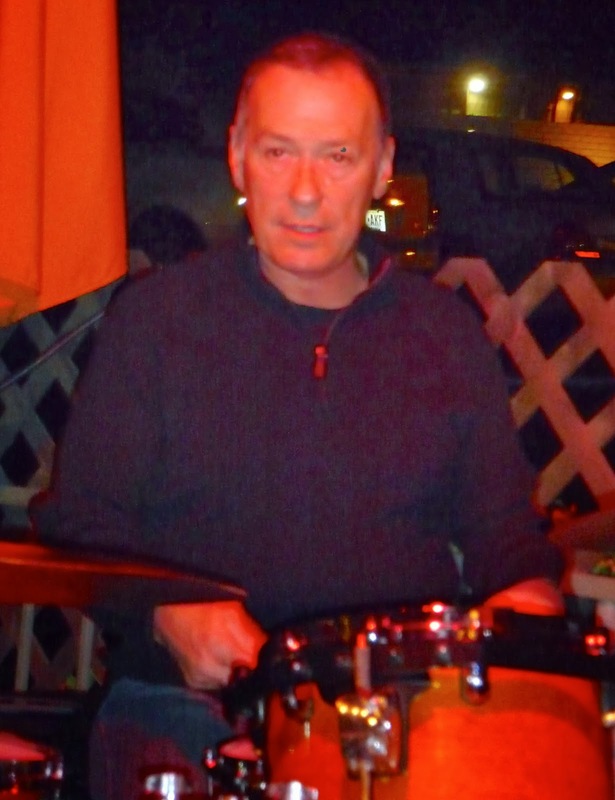 The fourth member of the group was Jay Lewis who is one of the most respected Drummers in the Valley. Jay is faultless in putting down just the right groove for whatever group he is playing with. 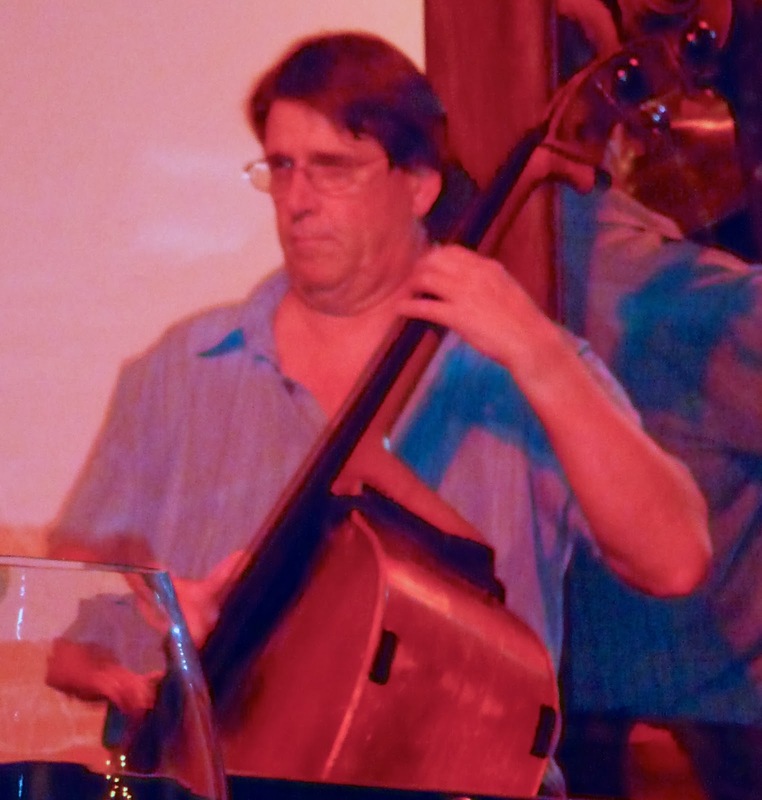 I would also mention that "Backstreet Bistro" has been a fixture for the Jazz community for years on Tuesday nights. 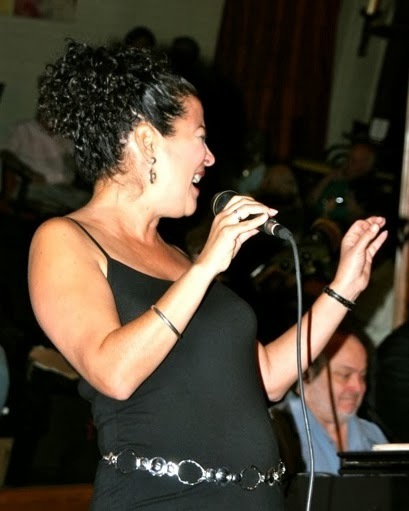 Many thanks to the owner, the lovely LaVane for her support of the live Jazz. In addition, the food at Backstreet is wonderful and reasonably priced and there is never a cover. The best deal in the Desert. 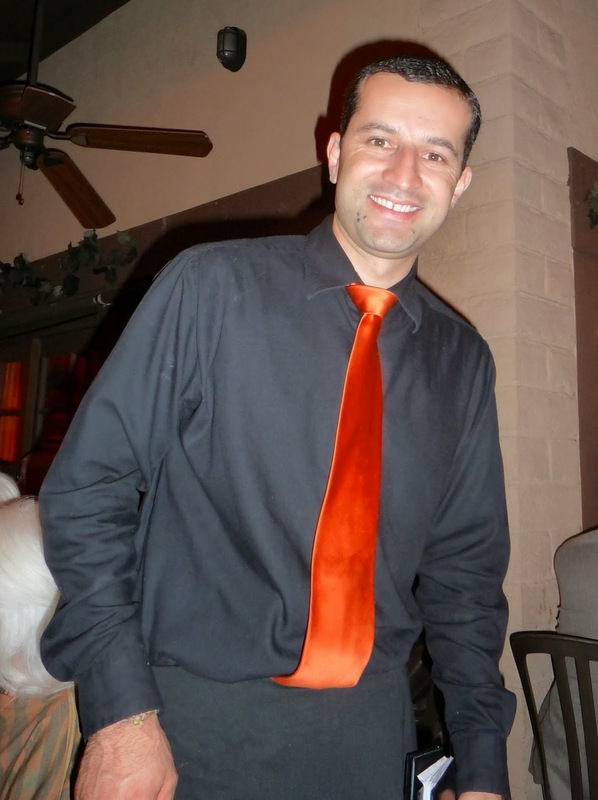 I wanted to recognize our waiter, Mario who does a great job not only as a waiter but also being able to in close quarters and never interfering with the music. Thanks Mario!